AUSTIN, Texas, Aug. 21, 2014 — Mobile business and productivity app leader, LightArrow, Inc., is pleased to announce Pro.Calendar, a powerful and intuitive calendar app with eight versatile calendar options including patent-pending “Time Ribbon™” views for iPhone, iPad and iPod touch. Designed for busy entrepreneurs, small business owners, parents, students, GTD® enthusiasts and anyone else who wants to stay organized and on top of their daily schedule, Pro.Calendar organizes work and life events, such as appointments, tasks, todos, reminders, health, fitness and more. Pro.Calendar is the “calendar edition” of LightArrow’s LifeTopix app. It includes all popular calendar relevant topics such as project management, events, travel, health, notes and media and allows additional topics to be purchased through in-app purchases for managing shopping lists, contacts, finances, assets, education, passwords, email feeds, Evernote® feeds and Twitter and Facebook feeds. Day, Week, Month, Year and List (Agenda) views with alternative view options. Time Ribbon view options for Day, Week and Month views. Calendar support for Google, iCloud, Yahoo and all calendars that iOS devices support. Integration with todo lists, calendar events and reminders from iOS devices. One-tap conversion of iOS Calendar and Reminder items into actionable items in the app. Custom views through calendar and item filtering. Fast switching between calendar views. Easy calendar event and item entry. Dark, light and colorful theme selections. Goal, health and fitness management. Integrated CRM and Social Inbox features available as in-app purchases. Additional integrated topics available as in-app purchases. Notes and files management with drawing and handwriting included. Association of notes from Evernote® and Toodledo® to Pro.Calendar projects, trips and goals. Association of tasks from Asana and Google Drive to Pro.Calendar projects and goals. Association of files from Dropbox™, Box™, OneDrive™ (SkyDrive) and Google Drive to Pro.Calendar projects, goals, events and other items. Instantly share and collaborate on items such as tasks through email. LightArrow built Pro.Calendar on the iOS and Mac-based LightArrow App Engine 8.1, which provides a common set of functionality across LightArrow apps with enterprise class common technologies and cloud integrations for its entire line of apps. The LightArrow App Engine has over four years of development and constant improvements with feedback from a 120,000+ user base. 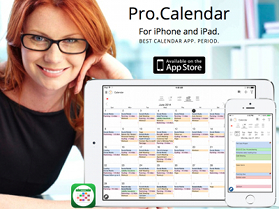 Pro.Calendar is available from the Apple App Store for US 3.99. As a universal app, a single purchase entitles the buyer to use this top productivity app on their iPhone, iPad, and iPod touch. The app requires iOS 6.0 or later and is optimized for the iPad and iPhone 5 with iOS 7.